Laser scannning Hoa Hakananai’a at the British Museum. Photo by J. Van Tilburg. 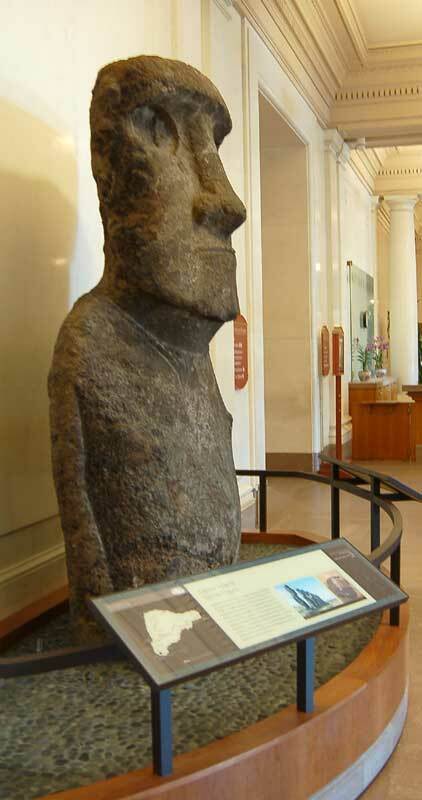 To date, Van Tilburg and the Easter Island Statue Project (EISP) have inventoried 887 monolithic statues (moai) and compiled a metric database buttressed by 24,000 original and archived images. 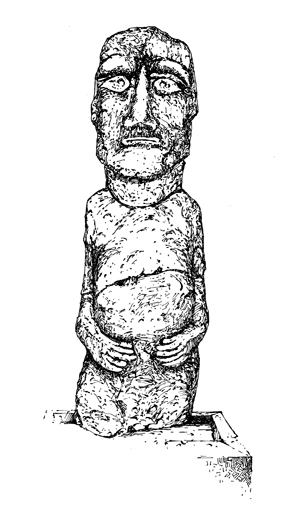 Some 35% of the known statues are located on or in direct relation to ceremonial sites called image ahu (Martinsson – Wallin 1994: Appendix 1 gives 164 image ahu; Van Tilburg 1986; Van Tilburg and Vargas C. 1998). 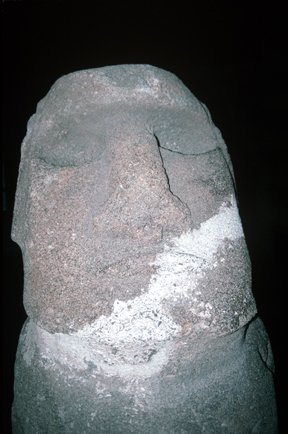 Rano Raraku, a volcanic crater on the island’s eastern plain, was the source of the sideromelane (basaltic) tuff from which 95% of the statues were carved. This source is irrefutable as there are 397 in situ statues, of which 141 in various stages of completion have recently been mapped by EISP in the interior quarries (Van Tilburg 2005; www.eisp.org). 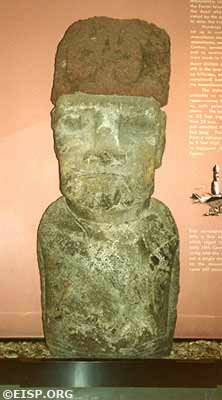 Much rarer statue lithologies are basalt (hawaiite lavas) from three named regions; trachyte and ‘red basaltic scoria’ or ‘red scoriaceous lava’ (also used as pukao or ‘topknots’ that were placed on the heads of about 75-100 statues). 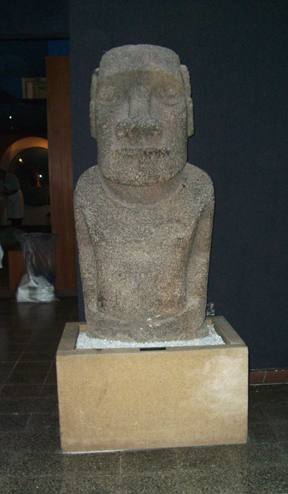 There are only 20 statues (portable and non-portable) now in the EISP database which were carved of basalt. Of these, 7 are in museum collections. 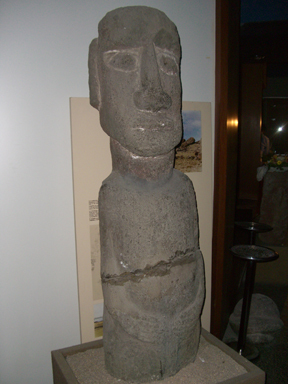 The British Museum holds two basalt statues, both of which are of central and very great significance to furthering our understanding of Rapa Nui history. One of them (1869.10-5.1) is re-carved on its dorsal side with bas-relief and incised petroglyphs of great iconographic significance. This re-carving is unique in its style, detail, and expertise and quality of execution. 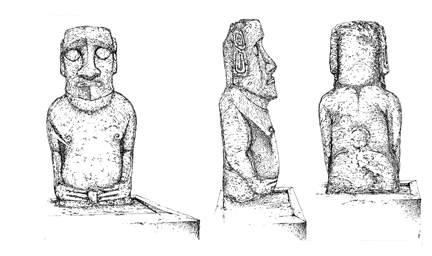 Four other statues, including 1869.10-6.1 (Moai Hava), have incised petroglyphs of lesser distinction but within clearly defined, limited typological categories. 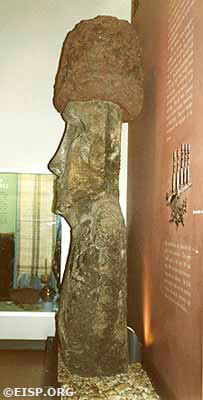 Another 30 statues still in situ on the island have applied decorations of similar styles. 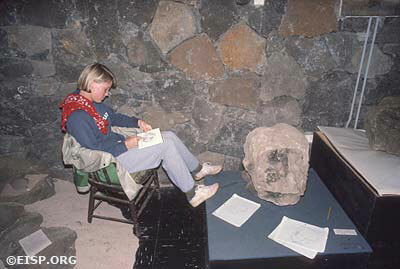 Lynn Lockie documenting a moai head at the Englert Museum, Hanga Roa, Rapa Nui. ©1984 EISP/JVT/ Photo: D. C. Ochsner. Following the work of Lynn Lockie in 1984, EISP expanded to include museum collections research. 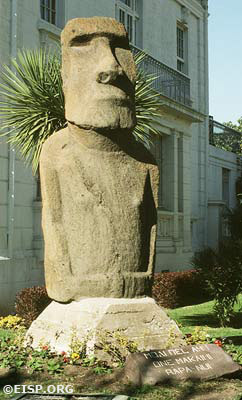 Statues, fragments, pukao and portable stone sculpture have been documented using the same attribute list that was applied to moai in archaeological contexts. 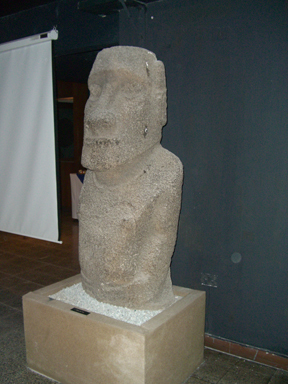 Ten intact moai, as well as 55 other stone sculptural objects including moai heads, torsos, pukao and fragments from major museums in the US, the UK, Chile, New Zealand, France, Belgium and Canada are now included in the EISP database. These objects have been culled from more than double that number that we have examined, and represent objects with the best documented provenance and what we consider to be the greatest formal relevance to moai design and chronology. Cristián Arévalo Pakarati drawing a moai head at the Smithsonian. Beginning in 1992, Cristián Arévalo Pakarati produced finished drawings of the most important of these objects in the island museum and on the Chilean mainland. 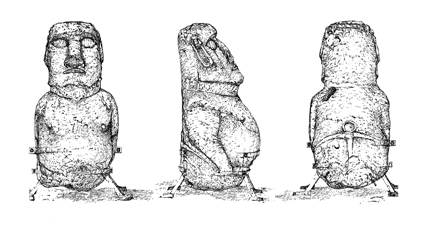 Some of those drawings were included in Van Tilburg’s first paper for the British Museum, “HMS Topaze on Easter Island: Hoa Hakananai’a and Five Other Museum Statues in Archaeological Context” (British Museum Press, 1992). 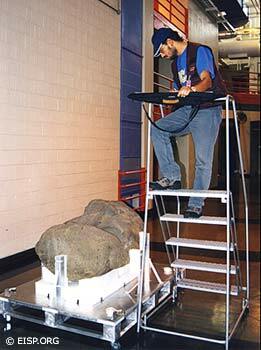 From 2000 to the present, Van Tilburg and Arévalo Pakarati have conducted further research at the British Museum; the National Library of Scotland and the Scottish National Museum in Edinburgh; the Ulster Museum in Belfast; the Pitt Rivers Museum in Oxford and, in the US, at the Peabody Museum, Cambridge; the Smithsonian Institution; the American Museum of Natural History, NYC; the Metropolitan Museum of Art, Chicago’s Field Museum of Natural History and elsewhere. 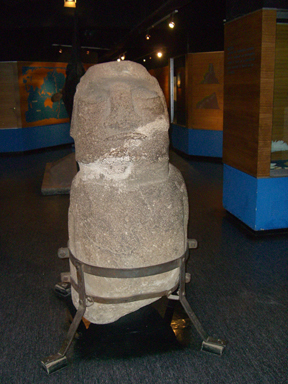 (far left, 2 images) EISP archive photos of Moai SI-WDC-001, located at the Smithsonian Institution in Washington DC, USA. Photos by Jo Anne Van Tilburg, 1986 © JVT/EISP. 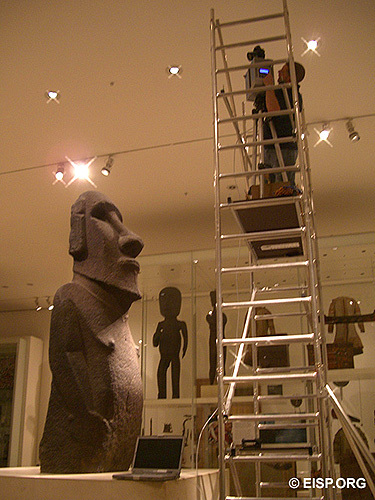 (left) Moai SI-WDC-001 is currently installed inside the Constitution Ave. entrance of the National Museum of Natural History, Smithsonian Institution in Washington D.C.
EISP archive drawings of Head SI-WDC-002 and Moai SI-WDC-001, both originally from Ahu O’Pepe, are currently in the collection of the Smithsonian Institution. Drawings by Cristián Arévalo Pakarati, 2000© JVT/EISP. RELATED RECORD: Cristiàn Arèvalo Pakarati, Rapanui artist and EISP co-investigator with Dr. Adrienne L. Kaeppler, curator of oceanic ethnology at the National Museum of Natural History, Smithsonian Institution, on site at Ahu O’Pepe. 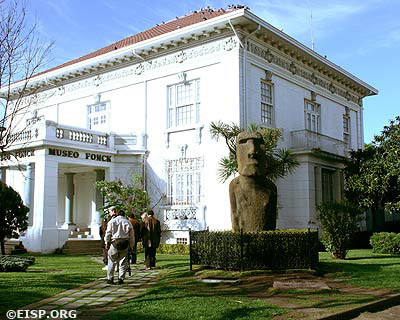 A page from Raúl Paoa’s sketch book, detailing the moai standing outside the Fonck Museum in Viña Del Mar, Chile. ©EISP/JVT/Sketch: Raúl Paoa.